Image and information to come soon! This work was commissioned by Sacred Heart University. World premiere at Sacred Heart University’s Spring Concert (March 2019). This work was commissioned by Fort Hamilton Joffery Academy. World premiere at Diversity of Dance's Dancing Beyond Concert at Manhattan Movement Arts Center (January 2019) then later performed at the High School Conference (March 2019) and Fort Hamilton Joffery Academy’s spring concert (May 2019). This work was commissioned by Diversity of Dance. World premiere at Diversity of Dance's Dancing Beyond Concert at Manhattan Movement Arts Center (January 2019). This work was commissioned by Brigham Young University and BYU’s Contemporary Dance Theater. World premiere at Brigham Young University’s Contemporary Dance Theater’s Concert (February 2019). Hearts of Men is a program created through and by Earl Mosley’s Diversity of Dance. This program, for boys/men of all ages, backgrounds, and experiences, creates an incredible community. Lost & Found speaks to this unbreakable community. The work speaks to the fact that even though this intensive is only in August (in 2018), the participants are forever connected by the relationships built through Hearts of Men. No matter how lost these participants may be, in their artistic or personal lives, they will always have the brotherhood and community created at Hearts of Men to support them. Always. World premiere at Diversity of Dance's Hearts of Men at The Ailey CitiGroup Theater (August 2018). "It [Jesse Obremski's Lost & Found] is the epitome of Diversity of Dance's Hearts of Men"
Courage is a work that has a deep relationship with the compositional score by Nils Frahm. Within the score, the flow is a constant and builds towards a climax similar to a wave, which the dancers encompass on stage. As the dancers continually move downstage, through the entirety of the work, there is desire cultivated to go against the grain, against the waves, against the normalcy of this forward motion. The work comments on our lives as artists, where we are making choices and challenging the field, and therefore the world, to think, act, and see differently. This work was commissioned by The University of Wyoming. World premiere at the Snowy Range Summer Dance Festival (July 2018). It was later selected to be performed at Colorado State University (February 2019) and will later be performed in 2019 as part of The University of Wyoming’s dance season (March 2019) and also at ACDA. 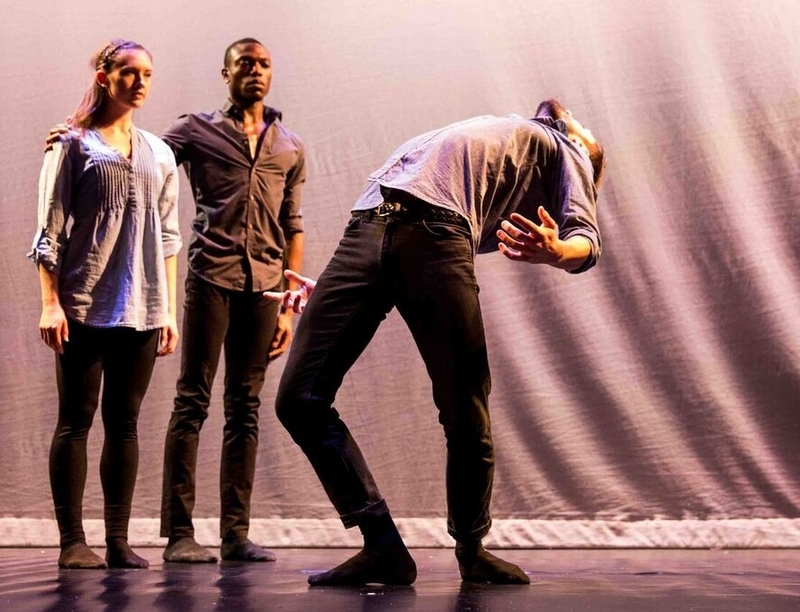 No Words is a dance film that has stemmed from the activism on gun control in America. The creation of this work was inspired by the impact of guns in America and asks the viewer to think further on what the next step could be in creating safer communities. The work is a fully collaborative effort between all parties of the team and has an original composition, No Words, created for this film by composer Trevor Bumgarner. This dance film was commissioned, filmed, and produced by The Roof Films at The Black Box Theater in The Church of the Blessed Sacrament (2018) and presented at Arts on Site (2018). The live version of No Words had it’s world premiere at DUMBO Dance Festival (October 2018). In a society that always has the newest news on the top of it’s feed, VIVID brings us back to the impactful events of 9/11 and our experience(s) into our minds. Through text of memory, multiple personal experiences with the event, and scientific studies on our memories, the artists flow through various circumstances and experiences which interweave into a humanistic look towards our recollections and thoughts of 9/11. World premiere at Earl Mosley’s Institute of the Arts (July 2018), performed at Hofstra University, and was further selected to be performed by Diversity of Dance at Bryant Park in New York City (July 2018). Brothers is a work in collaboration with performers, Terrence D.M. Diable and Michael Greenberg. Terrence, Michael, and Jesse, all born and raised in New York City, grew up dancing, collaborating, growing their friendships, and much more since 2003. The work represents the three's relationships throughout their lives together in New York City, whether being close together or miles a part. World premiere at Dixon Place's "Under Exposed Series" (February 2018), curated by Doug Post, and performed at The Battery Dance Festival (October 2018), Arts on Site (November 2018), and STUFFED: Dinner and Dance (November 2018). Their Voices is a work dedicated, in response to, and in support of all of those affected by the immense hurricanes of 2017. The performances experience a hurriance, throughout the space and internal, while clinging on to support each other selflessly. Cycle is an original composition created by an award-winning composer, Rob Ouyang Rusli, for Their Voices. World premiere at Diversity of Dance's Winter Repertory Showcase at Manhattan Movement Arts Center (January 2018). Chapter One is a study on perception, intention, and changing relationships. With a similar structure physically throughout the work, that matches the circular rhythm and repetition of the score, the dancers experience a possibly never ending cycle of different experiences, through varying intensions, while developing their relationship further with each occurrence. World premiere at The Choreographers' Collective's Showing at LaGuardia Performing Arts Center (October 2017) and at Dixon Place's "Under Exposed Series" (February 2018), curated by Doug Post. Affect the Effect is a work that plays with, against, and through the vibrant score to create a deepened relationship with it. Along with this, the dancers frequently manipulate each other and allow the music to influence them physically and qualitatively to an explosive "finish". World premiere at Earl Mosley's Institute of the Arts (July 2017). O is a work that requires immense openness and acceptance from the performers. Each performer is asked to bring any negativity to the forefront and face it heads on. While going on this individual journey, with these opposing factors, we view these collective and communal processes that each one of us faces and our support of each other to face these head on. Commissioned by the NOREE Performing Arts Organization, Mid-Fall is the first work performed by JOIN Ensemble. The work investigates the simple, yet disconcerting concept of falling: moving downward, typically rapidly and freely without control. This often precarious state, if one allows, can be a catalyst for creativity, freedom, and infinite discoveries. The Longest Minute, is an original spoken word composition created for Mid-Fall in collaboration with voice actor Alan Henriquez. World premiere at NOREE Performing Arts Organization's Playscape 2016: Dance & Music Festival (November 2016). Reputation is a solo that is an extremely structured improvisation to explore thoughts and emotions that are within someone at any stage of their life. Each performer bearings themselves to the work, through the improvisation, which in turn allows for honesty and openness with the work. World premiere at Earl Mosley's Institute of the Arts (July 2015), and later performed at the Harlem Arts Festival for Zest Collective (2015) and at The Juilliard School's April Workshop (April 2016). It was further selected for The Juilliard School's Choreographic Honors Concert (May 2016).